Tokyo Gas develops and promotes kitchen stoves fitted with highly efficient burners, highly efficient water heaters that recover latent heat, and residential power generation systems that utilize exhaust heat. While standard conventional residential gas water heaters have a maximum heating efficiency of 83%*1, the Eco-JOES highly efficient, home-use water heaters are equipped with an exhaust heat and latent heat recovery system that boosts this figure to 95%*2. Assisted by the industry-wide “Eco-JOES Adoption Campaign” to promote the introduction of Eco-JOES, the number of residential installations is rising every year. As of the end of March 2017, shipments reached about 7.24 million units for the industry as a whole. Due to their efficient use of heat, the Eco-JOES water heaters reduce releases of CO2 into the air and help reduce CO2 emissions and combat global warming. Their remote controls incorporate the EneLook*3 function, which displays gas and hot water usage, a visualization feature that helps users save water and energy. *1 For RUF-A2405AW(A), a conventional water heater. *2 For RUF-E2405AW(A), an Eco-JOES model. *3 Some remote controls do not support EneLook. Residential power generation employs combined heat and power (CHP) systems* that had been primarily used at large plants and buildings. This energy-saving system extracts two types of energy from one energy source, generating electricity and heat for effective use. The system also generates a sense of delight through the value of generating power at home. At the same time, it helps reduce energy consumption and CO2 emissions. 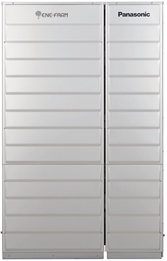 We offer the fuel cell ENE-FARM systems for residential power generation. *Gas engine-based CHP systems generate electricity and recover waste heat generated as a by-product. Energy that can be directly collected in nature is primary energy, while energy such as electricity, generated through the use of primary energy, is secondary energy. Properly assessing energy conservation and measures to fight global warming requires taking into account changes in primary as well as secondary energy. Since residential power generation takes place where electricity is also consumed, exhaust heat can be used for such purposes as heating water, which is not possible at thermal power stations. Note: Backup heat source equipment is used to generate hot water used for space heating. In May 2009, we introduced the world’s first fuel cell combined CHP system for detached housings, called the ENE-FARM, and co-developed the product with Matsushita Electric Industrial Co., Ltd. (now Panasonic Corporation). 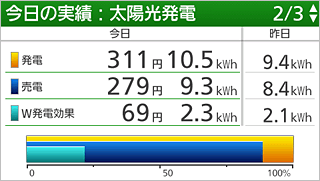 Tokyo Gas’ estimate for a standard case shows that the ENE-FARM CHP system reduces annual CO2 emissions by about 1.3 tons, compared to conventional systems, and is touted as the key to mitigating climate change using a residential system. The remote control panel in a kitchen or a bathroom features easy-to-understand displays of the amounts of power generated and used. It also shows, on a daily basis, how much the system has helped the environment in terms of familiar things in order to foster environmental awareness among family members. A network access service started in August 2017 allows users not only to see how much energy is consumed at home but also to obtain information on ways to use energy efficiently, using a dedicated smartphone application. For household use, Tokyo Gas proposes dual power generation, which combines solar photovoltaic power generation and the ENE-FARM, and the SOLAMO, which combines solar heating with the Eco-Joes highly efficient water heater. Each combination significantly reduces a household’s environmental impact and includes the kind of backup system required to actively utilize solar energy, which necessitates an unstable output of secondary energy. 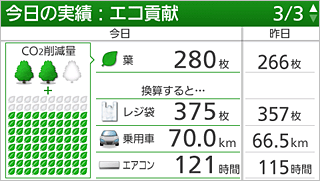 Note: The solar photovoltaic power generation system is not a product of Tokyo Gas.